Adventures in family, food, fitness and fun! This was the third Orff conference I have attended, but the first one where I have been a clinician! This was the highest profile audience I have ever addressed; music teachers from Maine to Alaska come to this conference, from college students to seasoned teacher-educators. I was more than a little excited and nervous! My session was entitled “Jump, Jive, and Patsch! Processing Swing Music and Dance for Children” and I presented it twice. This workshop is the intersection of my dancing experience, and my Orff Schulwerk teaching experience, and I am really proud of how it came together! So much of Orff teaching involves creative movement improvisation and folk dancing, and swing dancing is a natural fit for both of those. I was nervous because they had me assigned to present in a really small room, and 130 (!) people had signed between the two sessions. I squeaked as politely as possible, and the conference director was able to move me to a larger space, which really helped with the success of the workshop. I played swing music as people walked in, and I had bought Hershey kisses for the door monitor to distribute. First impressions are everything, and I figured it would also give people energy for participation. =) The introducer read my bio (which is starting to sound pretty impressive!) I took a deep breath, and the lesson just started to flow. Swing dance is something that I really love, and something that I am very comfortable teaching. I had prepared the best I possibly could, so I was really able to be present and enjoy the ride. It was so much fun to see all these teachers movin’, groovin’,’ and enjoying the music and dancing. Swing is such a joyful dance, I really think that no other dance form can compare to it! Seeing the delight on the participants’ faces as they performed in our final jam circle was priceless. I was especially happy to see one particular person enjoying himself immensely. Doug Goodkin is a nationally-known educator and clinician who specializes in combining jazz music and Orff, and he came to check me out! I was really excited to get his stamp of approval. 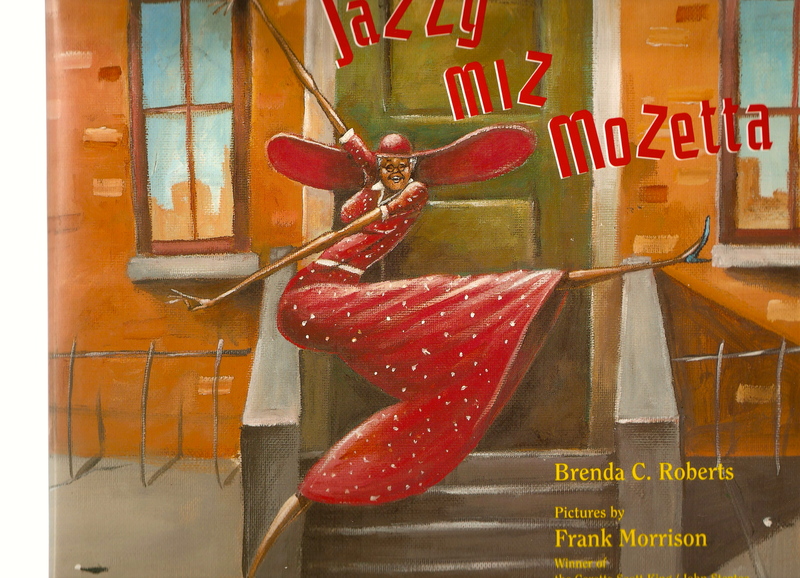 I finished off the workshop by sharing the children’s book Jazzy Miz Mozetta. 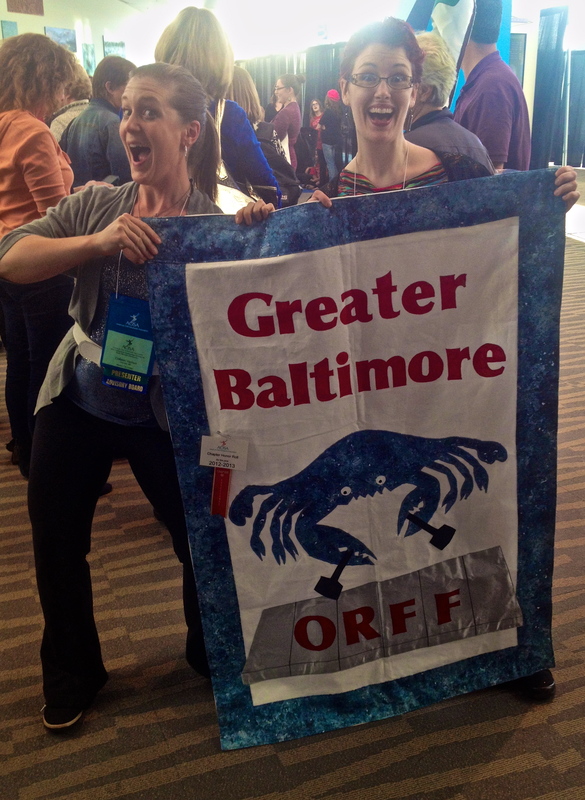 I just returned from the American Orff Schulwerk conference in Denver, CO. Teaching music isn’t without its challenges, but music teachers have the Best. Conferences. Ever. I started each day with Early Morning Song Sessions, led by past presidents of AOSA. These were my favorite sessions of the conference! The past presidents are all dynamic and inspiring educators, they have a presence that fills up the room and draws you in. We sang and danced to an Argentine Joroba, harmonized and hemiola-ed to a Zulu play song, moved and sang in 4-part canon, and read some soulful feel-good choral music. If every day could begin by singing “The Storm is Passing Over” with 50 trained musicians, I think my coffee would become unnecessary. Over the course of the conference, I danced inside of a stretchy silver body bag, led a Chinese dragon dance (with train of people wearing a long vinyl table cloth following me!) learned a stick dance from India, sang 8 part double canons, and made silly backwards videos on my iPad. I experienced some absolutely incredible children’s performances; trash Bands, marimba ensembles, choral groups, and more. 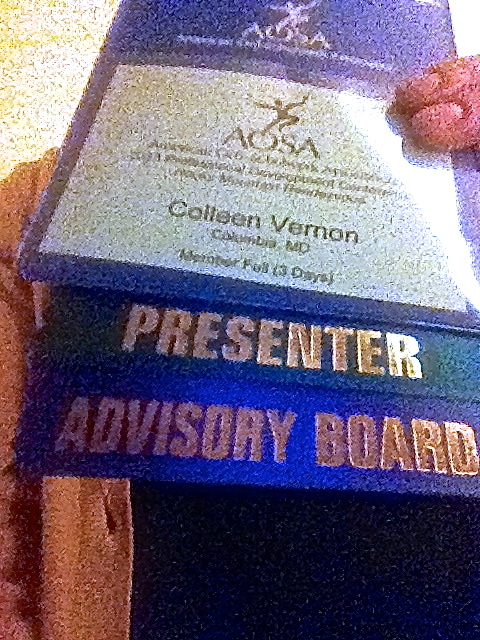 It is so energizing and inspiring to be around other teachers at these AOSA conferences. Every presenter has a different strength to share. Some are recorder gurus, some have amazing processes to teach mallet instruments, some know how to bring the dance out of the most tentative mover, and some are ethnomusicologists who collect songs and stories from all over the world. It can be daunting to experience so much excellence. There are so many great ideas presented, and most clinicians make it seem so easy and effortless you wonder how you could possibly be as great! It definitely gave me some new goals for myself and my teaching! Conference is educational, but it is also FUN! 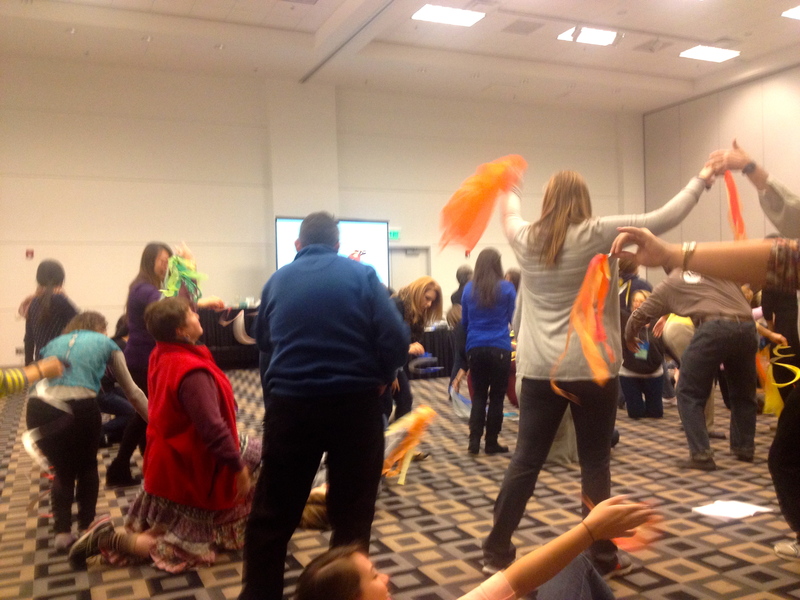 Music teachers are mostly crazy to begin with, and Orff teachers are a special kind of crazy. We burst randomly into improvised complimentary rhythm ostinatos, compose canons in the elevator, and don’t even blink when a clinician hands out scarf and tells you to create a water dance in five minutes GO! I wish I could have attended the late night folk dancing sessions, but I have become an early-to-bed person, and the 2-hour time difference didn’t help matters. I probably could have caffeinated and sucked it up, but I was actually PRESENTING on Saturday and wanted to make sure I still had some juice left for that! More on my presenting experience tomorrow!